Great selection of glasses and amazing customer service. Came here after my husband broke a pair of his glasses. We had a few questions about our insurance and Kay was very knowledgeable and detailed while answering our questions. My husband tried on many different styles before choosing a frame. Kay knew a lot of information about each frame and helped us compare them. Overall, we were very impressed with K's Optical and will come here for all of our eyewear needs from now on! This place is great! The selection is wonderful! I found just what I was looking for. Great prices on designer frames, as well some stylish less expensive frames. I already have a wishlist for my next eyeglass purchase here. Kay is great as well! She is very helpful and gives honest feedback on what looks good on you. I highly recommend this eyeglass store. Went to K's last Monday to check it out because we haven't been happy with our current optician. Door has a security code which I called and was let in by a friendly voice. Went down to the store met Kay who let us in even though the store wasn't open on Monday. Spent 20 minutes while she repaired and adjusted three of our glasses. Didn't charge us and even gave me a free case for one of my glasses. Very friendly and she listens. K's will be our place for eyewear from now on. Best selection and service! Kay's knowledge about the sunglasses sets her apart. She is very helpful and spot on selecting the right pair of frames for you. Her exclusive and unique selection of frames from around the world sets her apart. My family has been going to her since 2015 and only trust her for our eye glasses. Thank you Kay for your kindness and endearing interaction. Before visiting Kay's, I read the great reviews and gave her a call to check on insurance coverage. It was a call that was informative and fun...so, off I went to Kay's. Finding it was a challenge for me. It's located on the street level of a large apartment complex and I drove right by her not-so-attention-getting sign on the sidewalk. Once you find the store, there's parking on the second level lot for this forgettable complex. Get ready for perkiness and enthusiasm from a darling woman who LOVES WHAT SHE DOES!!! It shows! Kay worked with me to find the exact frame I was seeking. When I informed her I wanted glasses like Lester Holt currently wears on the NBC News, she laughed and knew exactly what I meant. Since my insurance only covered a portion, Kay worked on the price, with magical discounts, to make it the frames more affordable. I truly appreciated her efforts. She told me she wanted me to be "going around showing-off my 'Lester Holts' and feeling great!" How sweet! Kay knows how to build her business with the most effective marketing tool imaginable..."Word of Mouth". It was great to go pick them up,too. So amusing! Kay is great and you'll love the purchasing experience and, most likely, Kay, as well!!! Kay is the best, and has been my friend, and optical provider for 20 years, and for the past 10 years, still taking care of me from , Dallas to my current home in Las Vegas. I wouldn't think of going to anyone else, Why lower the bar? Kay is ... World Class. You will be thrilled, and have a long great relationship. Thanks Kay, and wishing you, all the best.. I thank my optometrist for recommending Kay to me. I knew I was in the right place by the great selection of frames and by the way Kay really studied my face and made fun recommendations. I love my new glasses and would so encourage people to stop in, meet Kay and see all the great choices. 5 stars for sure on all levels !!!!! I went to four optical stores and found the people to range from politely helpful to hands-off, then I went to Kay's and found her to love her career and her clients. Rather than me browsing the racks as I had at other stores, Kay sat me down and dashed around picking out a half dozen frame frames she thought I would like. And I did. It's really that fashion consulting touch that made her stand out for me. Great place for glasses. K is a genius with finding the right frame for your face and making glasses fit properly. Great selection of frames, knowledgeable people. Love this place and can highly recommend it. Kay you're the best! I couldn't wait for my glasses to write this review cause I know I'm gonna love them! I might get addicted to changing up my style! Thank you thank you. Literally, as good as it gets! After a mix-up with my frames and prescriptions, Kay immediately set about to rectify the problem, going out of her way, at significant expense, to make it right. The result? An incredibly grateful customer who recommends you use K's Optical without hesitation, and will return as long as I have eyes in my head. A very welcome addition to our Edmonds community. My husband and I walked in here by chance one day searching for someone open on Saturday afternoon and we are so glad we did. Kay is wonderful! She has a refreshingly modern selection of frames at great prices. Another thing we really appreciate is her expertise in finding the right frame for your style and face shape. She is all about quality and great service. My husband loves his new glasses, I'm next and I can't wait. Parking is a little tight and off to the side. Kay is our new optometrists. Thank you so much Kay!!!! I would recommend everybody to go see Kay. She's not only friendly but she makes you feel like family. She is honest and will tell you the truth about how you look and what glasses look best on you. Visited K's Optical on recommendation from my mother who is a frequent customer. Took our spirited 6-year-old in to select frames. We were graciously greeted the moment we walked in. They had a nice assortment of kids frames and were extremely attentive and patient. We were in and out in a short period of time which was appreciated considering the circumstances. Purchasing frames for a child can be chaotic but they made the experience pleasurable and our son is excited for his new frames. This is definitely our new optical store! K’s Optical is a world class, professional company. Kay pours her heart and soul into doing the absolute best she can for her clients. 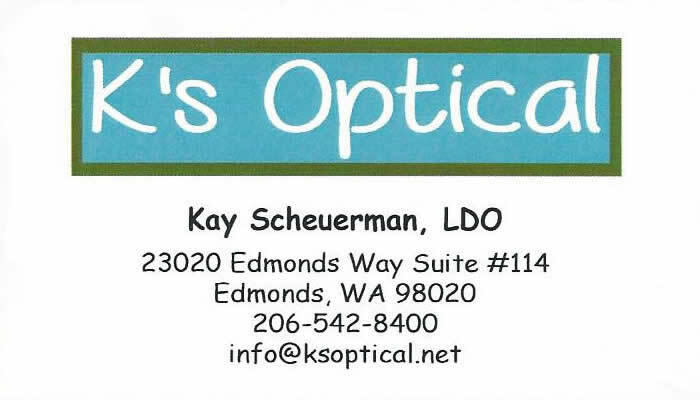 Edmonds is very lucky to have her and K’s Optical! K’s Optical offers first class service. She is a true professional and is very knowledgeable. I have known Kay for several years and each time I deal with her I am impressed by her knowledge, great disposition, friendly demeanor and generous spirit. She is one of a kind, and the best in her line of business.